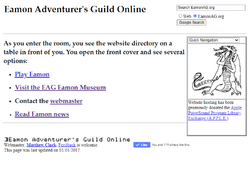 Eamon Adventurer's Guild Online is an Eamon website administered by Matthew Clark that serves both as an online repository for the resources of the Eamon Adventurer's Guild and as a source of news about the Eamon community. Launched 1 April 2003 at earthlink.net, the site moved on 22 November 2003 to its current location at eamonag.org and is currently hosted by the Apple Pugetsound Program Library Exchange. This page was last edited on 3 March 2019, at 16:04.